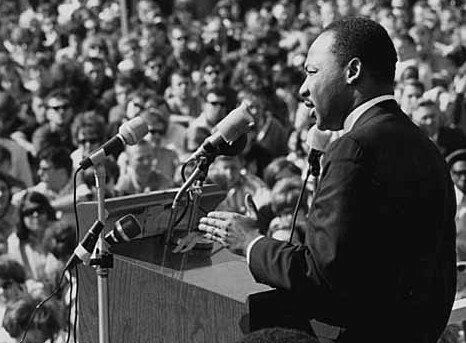 King Day, celebrated on January 15 in 2018, is a United States federal holiday to honor the memory of Civil Rights leader, humanitarian, and Nobel Peace Prize winner Martin Luther King, Jr.
Martin Luther King would be 89 if he were still with us. Martin Luther King Jr. was born on January 15, 1929, so this year, 2018, we are celebrating King Day on King's actual birthday, which happens to be the third Monday of the month this year. King would be 89 if he were still living, but he was assassinated on April 4, 1968, when he was only 39 years old. I was in high school in a suburb of Chicago, and I remember that time well. It was a time of sadness, anger, and uncertainty. The death of King was followed by riots in many cities and towns, and I can remember military helicopters flying over Chicago, 8-10 miles east of the suburb that we lived in. I also remember some of the first celebrations of Martin Luther King, even before King Day became an official federal holiday in 1986. I don't remember the exact year, but in 1979 or 1980, before government offices and financial institutions were routinely closed for King Day, a black woman that I worked with organized the black employees in the office to bring treats on King's birthday, focusing on family recipes, all to raise awareness among all of us of the life and times of Dr. Martin Luther King. No school, but what does that mean? Now schools are out on Martin Luther King Day, and that is a good way to get children, both as parents and as teachers, to talk about Martin Luther King, the Civil Rights movement, where we are today in the world, and where we go from here. The birthday of Martin Luther King should never be treated as "just" a day off from school. Many talk about Martin Luther King Day as a Day of Service. Here's a start: The (Martin Luther) King Center in Atlanta, Georgia, talks about the meaning of the King holiday HERE.